The English Standard Version or ESV has become a very popular bible. It’s being heavily promoted by pastors, organizations, some scholars and bible teachers from different denominations including Catholics around the world, and Calvinist, but it’s gaining acceptance in other denominations as well. According to Calvinist teacher John MacArthur the ESV is the best translation which he compares with the Authorized King James, he now sells ESV study bibles with his signatures & notes. But is the ESV a good bible translation? Aren’t all bibles the same? Where does it comes from? The ESV changes more than 2,800 words to make it a gender-neutral bible (Gnostics believe in a both gender or androgynous god). Many bible verses are completely missing from the New Testament of the ESV, RSV & all modern bible versions including the Jehovah Witness version “New World Translation” NWT (except for the Modern English Version MEV which uses the Majority Text) : Matthew 12:47, Matthew 17:21, Matthew 18:11, Matthew 23:14, Mark 7:16, Mark 9:44, Mark 9:46, Mark 11:26, Mark 15:28, Luke 17:36, Luke 23:17, Luke 24:40, John 5:4, Acts 8:37, Acts 15:34, Acts 24:7, Acts 28:29, Romans 16:24. But there are many more changes, you can see some tables of comparison, ( remember ERV is the basis for ESV, with only 5%-10% of changes from original ERV): differences. Altered Verses, Another Bible – Another Gospel, Bible Version Comparison. 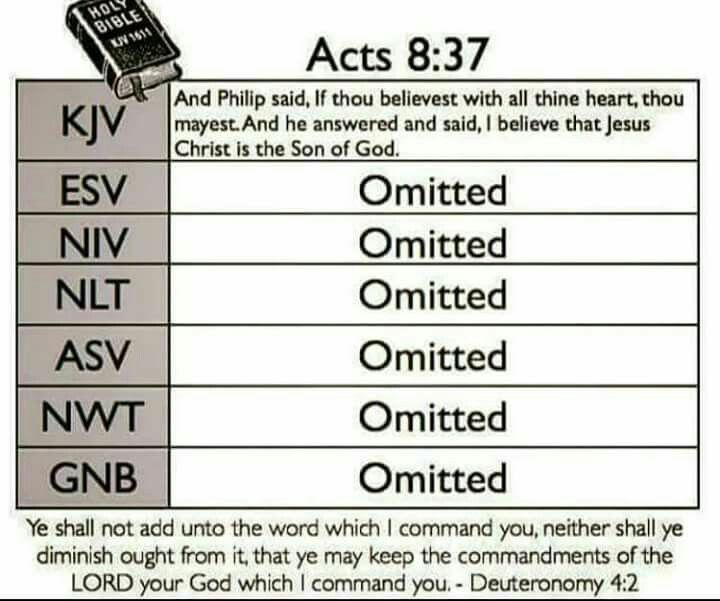 A quick test that we can do to find out is: Any version of the Bible which omits Acts 8:37, “Philip said, “If you believe with all your heart, you may.” (be baptize) He answered, “I believe that Jesus Christ is the Son of God.” and that also omits the words “through his blood” in Col. 1:14 “In whom we have redemption through his blood, even the forgiveness of sins:” then evidently has for its foundation a corrupted manuscript. Syrian bibles, with some major versions: The Peshitta, with more than 350 manuscript some as early (A.D. 145) but some others as old as 5th century (the Peshitta is considered the third & last stream of family manuscripts, an Aramaic translation that even it is close to Textus Receptus it has significant variations ). The Diattessaron, Syriac Bible (A.D. 165-175), the Old Syriac (A.D. 400), the Palestinian Syriac (A.D. 450), and the Philoxenian (A.D. 508) This last one was revised by Thomas of Harkel, in A.D. 616, and because of that it’s also known as the Harclean Syriac. The Old Latin Vulgate or Italia 157 A.D. (this is not Jerome’s Latin Vulgate of 382 A.D. but this translation was made for the young churches established in the northern Italian Alps & was one of the manuscripts used by Erasmus), notice it was made two hundred years before the Sinaiticus and Vaticanus were produced, & a full century before the theorized “Lucian Recension”),. The Waldensian (A.D. 120 & onwards), The Gallic Bible A.D. 177 (Southern France), The Gothic Bible (A.D. 330-350), The Armenian Bible (A.D. 400) There are around 1,244 copies of this bible version still in existence today! But if all these wasn’t enough the New Testament quotations of the writings of the early church, Chrysostom, the early Fathers of Antioch in Asia Minor, etc. (more than 86,000 citations from Scriptures) agree with the Textus Receptus manuscripts . What About the NASB, NIV & Other Translations?